I've always been a fan of luxury hand soaps. Not that there's anything wrong with Softsoap or Dove, but once in awhile a girl's gotta wash up with something a bit more fabulous! So I'm introducing a new series with some of my very favorite hand soaps -- check out Philosophy Amazing Grace Perfumed Hand Wash after the jump. A unique blend of soft floral blossoms and delicate white musk make Philosophy Amazing Grace Perfumed Hand Wash a true standout. The scent is light, fresh and supremely feminine -- and two pumps from the dispenser create a beautiful foaming lather. As always with Philosophy products, I'm enamored of the packaging. 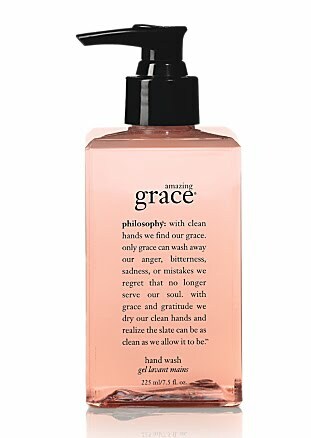 In this case, a square bottle is printed with the Amazing Grace mantra, my favorite part being, "With grace and gratitude we dry our clean hands and realize the slate can be as clean as we allow it to be." I love this scent! One of my favs! I have the little perfume and the body wash yum! It's divine, isn't it? One of my all-time favorites.